Inky Fairy Designs: Trying something new with something old! Trying something new with something old! Hi everyone! Most of you know my coloring medium of choice would be Copic Markers but every once in awhile I will venture out with something new. Today I colored my image using Faber-Castell colored pencils and I colored on canvas paper. Whoa, watch out! LOL I finally finished this birthday calendar project and I just need to figure out how to use the Bind-it-all machine I bought last year so I can put it together! 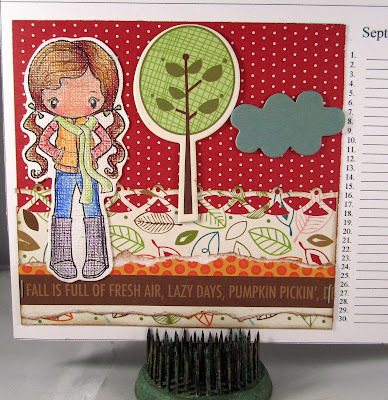 The image is from the Special Autumn set by The Greeting Farm available now at 7 Kids College Fund!! I think my favorite part of this image are her cute little boots!!! The papers and chipboard are all Bella Blvd. I used Helmar 450 Quick Dry to make sure the chipboard would stick as my mom will be using this calendar over and over. This is what I created for the month of December hence all the cute fall papers. What a neat texture it has to it on the canvas paper..fabulous! Love the effect on the canvas paper Carisa! Gorgeous colouring Carisa, love the textured look. Love the texture from the canvas! Very cool idea! Love it. Beautiful bows with May Arts & Helmar! Creating is Fun - Exciting Announcement! !